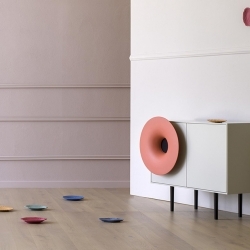 Caruso, music cabinet with embedded hi-def bluetooth speaker entirely handmade by Italian masters in Meolo. 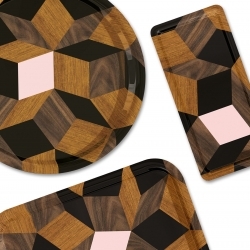 By Italian designer Paolo Cappello for Miniforms. 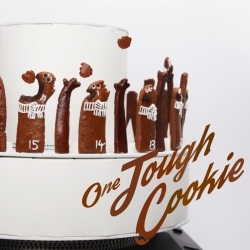 VIDEOBuilding a zoetrope from cookies, animators Klaas-Harm De Boer, Veronyka Jelinek and Tiddo Muda give their sweet Christmas wishes with One Tough Cookie. 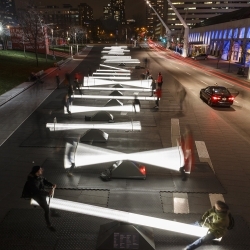 Canadian designers and artists has created an immersive installation in Montreal consisting of 30 illuminated seesaws. 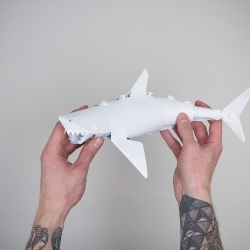 A new collaborative partnership with Brooklyn designer Matt Cavanaugh of Death at Sea studio and Kontextur brings table objects to life with the Shark and Scuba Diver puppet-like kits. 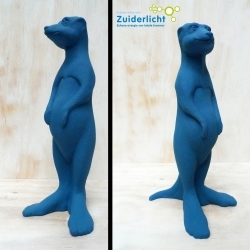 Paultje is a life size Meerkat made for the Amsterdam Energy Cooperative Zuiderlicht, which stimulates the generation of clean (solar) energy. 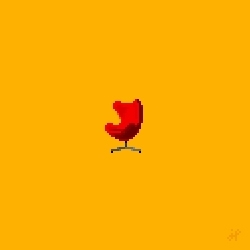 Design studio Featuring-Featuring. 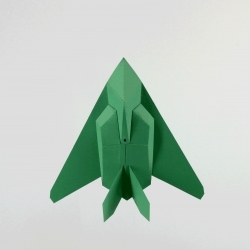 Paper models of war planes in various colors and patterns, with £1 from every plane sold going to UNICEF. 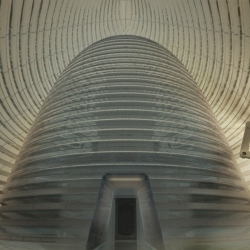 Mars Ice House, an idea by Clouds Architecture Office for a 3d-printed habitat on Mars, awarded first place by NASA. 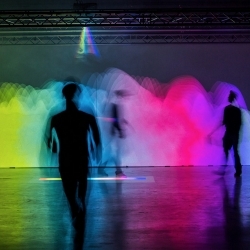 VIDEOFlux - A physical kinetic sculpture, that plays with our perception of reality. 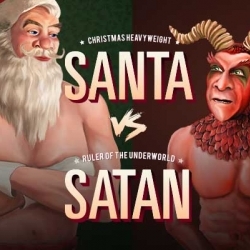 Santa vs Satan. Forget work. It's time to play! In the festive spirit of the silly season, a fun game that's a little naughty but largely nice. The ultimate yuletide rumble. Feeling naughty or nice this holiday season? 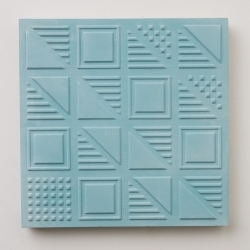 A range of beautiful embossed three-dimensional cement tiles inspired by the London Underground archives, created by Lindsey Lang for Transport for London. 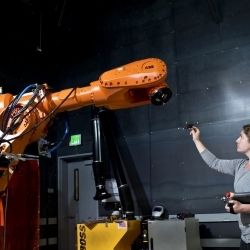 VIDEOMadeline Gannon on becoming a Robot Whisperer at Autodesk Pier 9. The Surf Grooming kit Noir edition, The most sophisticated maintenance kit for your surfboard on the market! 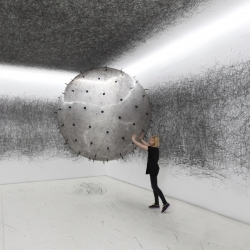 The new installation by the Canadian artists Catlind r.c. Brown and Wayne Garrett is called ‘CLOUD’. 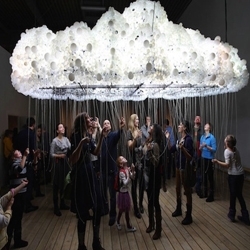 It is an interactive cloud project that consists of 6,000 new and burnt-out lightbulbs. 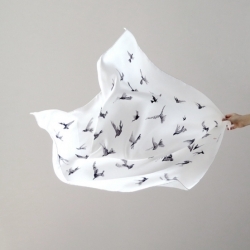 Martin Azúa designs 47 Birds Scarf inspired by the view from his studio window in Barcelona. 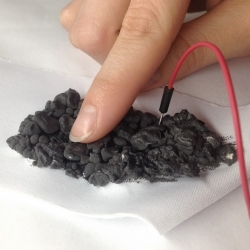 Design studio EjTech mix electrically conductive paint with puff ink to create a never seen before puffy sensor on fabric! 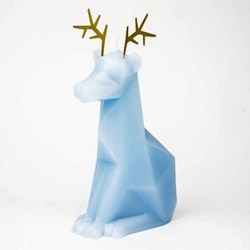 PyroPet Dýri Candle - a reindeer holiday version of their classic cat with metal skeleton. "Dýri is a short for hreindýr, which means reindeer in Icelandic. But it also means beast. - Unleash the beast!" Krakken, 2015. 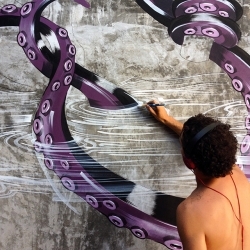 Mural in progress by illustrator & muralist Gibran Julian. 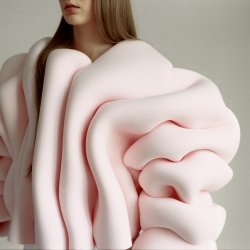 Utopian Bodies: Fashionable Innovation and Imagination-to-Wear at Liljevalchs Museum. 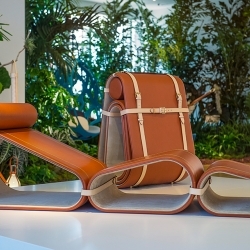 Louis Vuitton Objets Nomades Collection at Design Miami - As a continuation of its “Objets Nomades” collection, Louis Vuitton hosted another presentation at this year’s Design Miami. 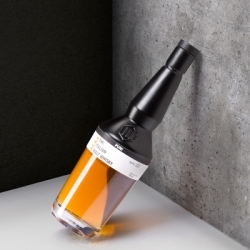 OLi is a stand-type Bluetooth speaker that allows music to fill up your surrounding. OLi is to be stood in different areas of the house instead of filling up spaces on tables or shelves. 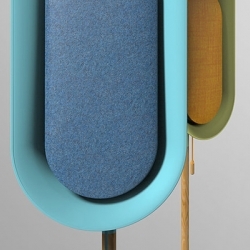 OLi differentiates itself as more of a furniture rather than a tech-product. 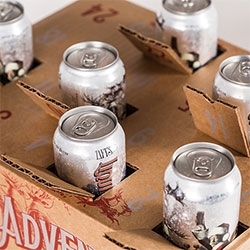 Liquid Advent Calendar - that you'd keep in the fridge! 1 Trick Pony named, branded and designed the packaging for this limited-edition, holiday release from Taft's Ale House. 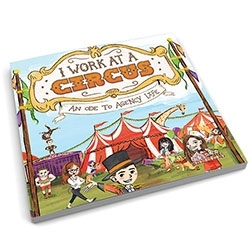 "I Work At A Circus: An Ode To Agency Life" - A storybook for all the people in advertising that have to constantly explain their jobs. 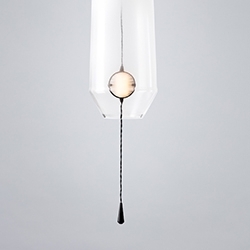 VANTOT is a Netherlands-based studio made up of Sam Van Gurp and Esther Jongsma, and their most recent collection is called Limpid Lights. 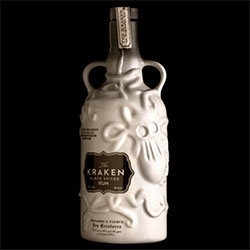 A limited ceramic bottling of Kraken Rum - designed by Stranger & Stranger! 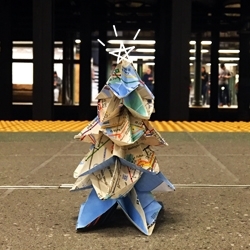 Christmas Three is a deconstructed version of the Christmas tree. 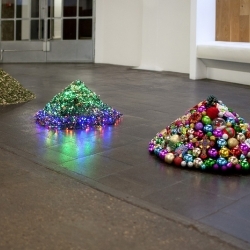 It encourages the viewer to take solstice: to come to a stop, make stand still, and thus reflect on the year that was and look forward to the year ahead. 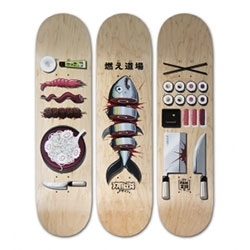 Burning Dojo skate deck triptych by FAKIR. 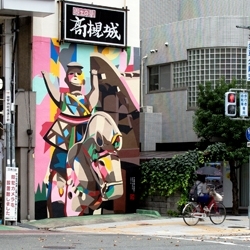 Limited edition of 30 by Last Concept Shop. 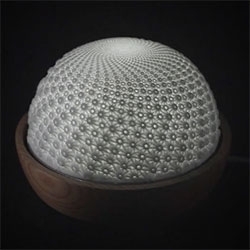 NO_THING – An infrared light framework that turns (almost) anything into a device. Best of the best of all time. 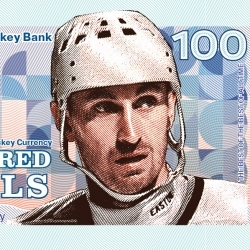 This ice hockey currency. Complémentaire is a collection of objects created by the french designer Benoît Gaignard with wicker and wood, a creative alliance between artisans and designers. 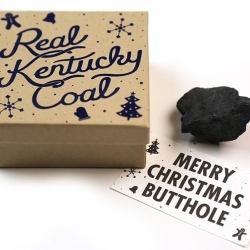 Send A Jerk A Lump Of Kentucky Coal For Christmas! 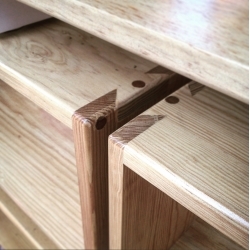 Perigonal is a furniture project based in Mexico, created out of the idea of re-using wasted materials from the carpenter and blacksmith's workshops that we collaborate with. Porterlight Bicycles x East London Liquor Company. 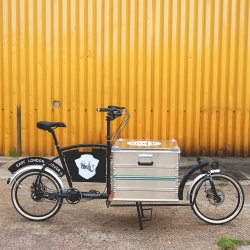 Custom delivery cargo bike for delivering craft spirits direct from distillery to local shops and bars in London's East End. 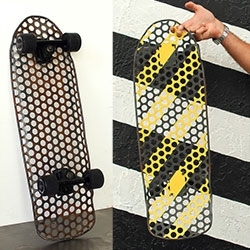 RAD Furniture's new skateboard - constructed of heat-bent perforated steel, it's as much fun to ride as it is to make. 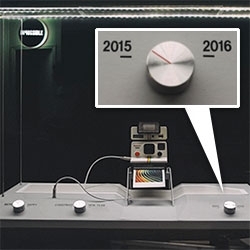 The 2015 christmas window display of the IMPOSSIBLE Project shop in Paris by Graphset. 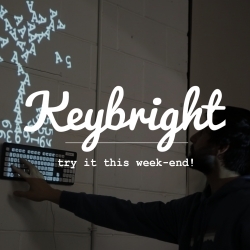 Keybright is an opensource tool to help anyone make a fun and beautiful light-installation at home in minutes. 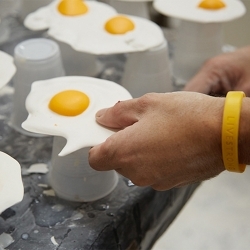 The vision is to build a DIY happy physical/digital experience at home. 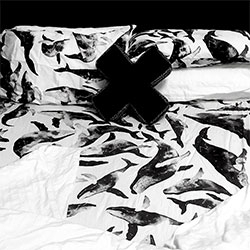 The Herd bed sheets designed by Furry Little Peach (aka Sha'an d'Anthes) - beautiful water colored whales print. 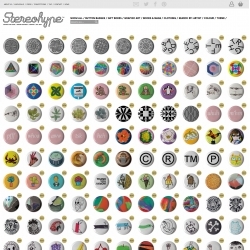 London-based graphic art label Stereohype just added this year's button badge design competition winners and B.I.O. (By Invitation Only) Button Badge Series to their now 1125-strong collection featuring artworks by over 300 international talents. 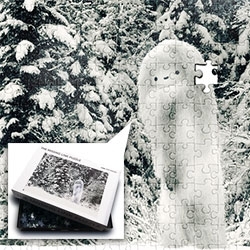 Pictoplasma Missing Link CryptoPuzzle - Limited Edition of 500. 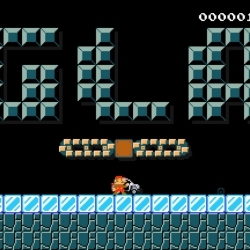 There are 999 PIECES (+ 1 missing) Complete the Puzzle to retrieve your Missing Link! 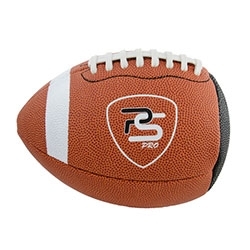 Passback Footballs - a football with a flat side so you can play catch with yourself. Apparently good for solo practicing. 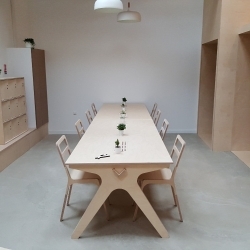 MIX is a new openspace for coworking in France, near Lyon, with wooden furniture and interior created by La Fabrique and Open Desk.